At AML, we use state of the art multi sensor measuring machines for inspecting fragile, miniature and contact sensitive parts such a gold plated, rubber, silicone or other precision molded parts which cannot be measured by other means. The machines can be operates with sensors such as Vision, Laser, Touch-probes or also with a rotary device. 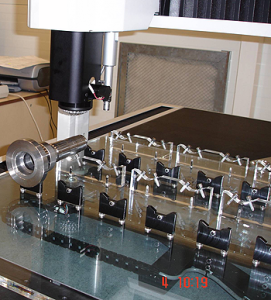 Large part samples can now be measured precisely saving time and money while dimensional integrity is maintained by using superior optics and other high performance sensors. Our Non Contact Inspection Service practices quality procedures per AS 9100 Rev B & ISO 9001:2008 guidelines. We use a hands-on management approach with the best team of trained professionals.